Mold removal can be a complicated and confusing process for many people. You’re already stressed that mold was found in your home or business and you just want it out, but the proper way to remove it may not be what you’d expect. That’s understandable, and that’s why professional mold remediation is needed. Experts spend years studying and getting on-the-job experience so they’re capable of dealing with any mold situation that may arise. We hope to make the process the least stressful as possible and give you the reassurance you need that your mold removal will be dealt with swiftly and effectively, so you and your people aren’t exposed to further danger. Q: What Does Mold Look Like? A: Mold has many different appearances from varying textures, colors, and sizes. Unfortunately, mold can take on several different appearances and it can sometimes be difficult for the naked eye to detect mold. It is sometimes confused with mildew or even just dirt, depending on it’s appearance. Mold can vary in color from black to green and anything in between. Sometimes you can immediately notice that you have mold from the appearance or odor, but some spores are hard to recognize. It’s best to get an expert to come to your home and identify what you’re dealing with instead of taking a guess. Once the mold is identified, mold removal can begin. Q: How is Mold Detected? A: Mold is usually detected by its characteristic musty odor that causes a person to investigate the source of the odor. Mold spores are usually found after looking further. It’s important to know that not all mold has an odor, so some can be present without ever smelling that well-known musty smell. Sometimes you’ll see the mold before you smell it, and in some cases, you’ll accidentally discover it while going about your day. In some cases, you won’t know it’s there until it’s become a major problem. A: Mold can be caused by many different things, but in most cases a warm, damp area with poor ventilation and some type of nutrient will cause mold. 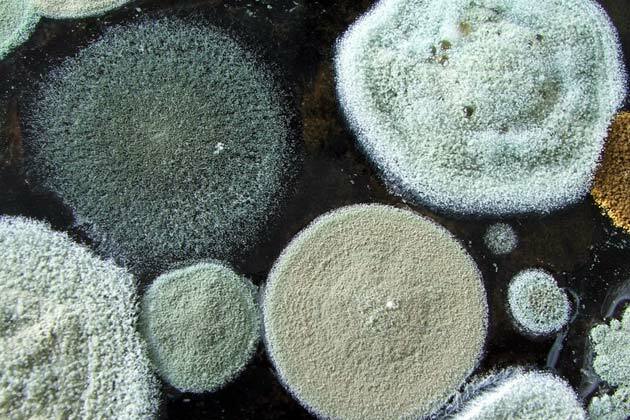 There are at least 300,000 types of mold! Since there are so many, and mold can have a lot of variety, we can’t list all the ways mold can grow. The easiest thing to keep in mind is that mold will grow in an area that doesn’t have proper ventilation and that’s warm and damp. Mold can grow on anything it can absorb nutrients from – dead skin cells, wood, cardboard, fabric, etc. Q: Can I Remove the Mold in My Home Myself? A: You shouldn’t remove mold yourself unless you can throw out the contaminates without any danger to health. Mold is difficult and tricky, and in some cases, you can actually make it worse. Mold should be removed using the IICRC mold removal guidelines, which our team at TSC Restoration are very familiar with. You may encounter common household mold while you’re doing your normal housework. If the patches are small and don’t pose a major health risk to you personally, you can wear protective gear and clean them off hard surfaces like glass, tile, porcelain, and metal. In some cases, like with dishes, you can simply throw away the contaminated materials. It’s better to be safe than sorry since some mold spores can be deadly. These questions barely scratch the surface of all the things that come up about mold and mold removal as we are working with our clients each day. We hope that the knowledge we’ve provided here is helpful and we invite you to give us a call if you have further questions about mold and mold remediation. And if you ever need a dependable mold removal contractor in San Diego, please consider TSC Restoration, Inc. This entry was posted in How to Guides, Mold on April 25, 2018 by TSC Restoration.